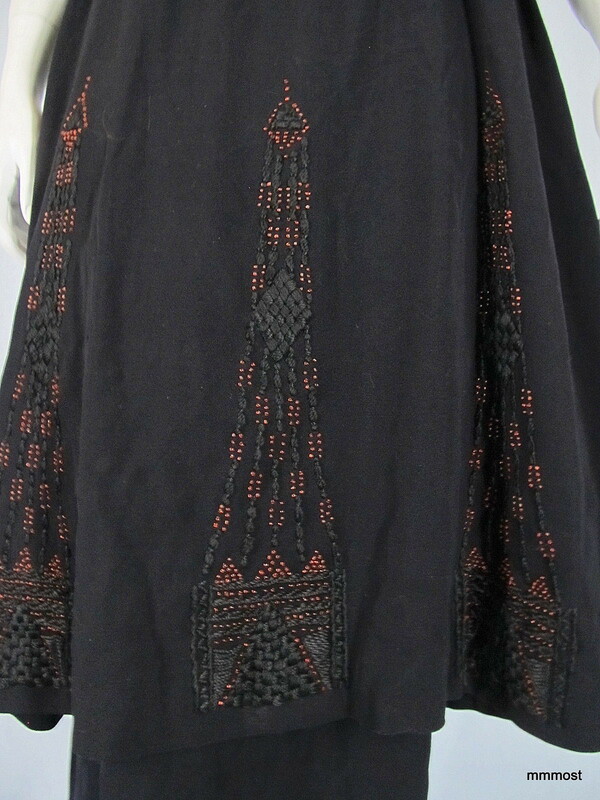 Featured in this auction is a beautiful black wool gabardine dress from the late-1910s...It gives the appearance of a sleeveless overdress over a dress with short sleeves and slim skirt, but is all sewn together...It is embellished with black embroidery and orange seed beads around the neck, sleeves and overskirt...A silk underblouse has a band at the waist......It has hooks and eyes and snaps for closures down the center from of the underblouse, left shoulder and left side...There is a tear and a few tiny holes on the left side of the under skirt (see photo) and overskirt in the same area that can be mended...The silk underblouse is stained and is shattered in places...Otherwise, it is in very good and wearable condition...Additional closeup photos are in the gallery at the top of the listing. Take a look at an ad from 1922 in the American Cloak and Suit Review for Realart Dresses by A.E. 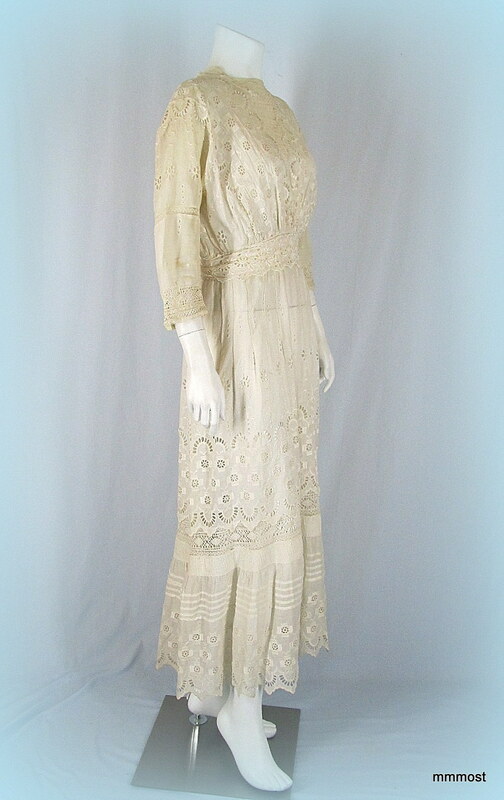 Lefcourt...Their wholesale prices were $22.50 to $95, quite expensive then, $600 to $2400 retail in today's dollar...I wonder what the retail price was for this dress, only a first class Titanic passenger could afford it! 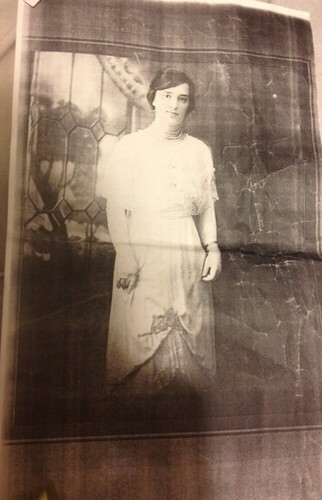 This is probably from about 1918/1919. 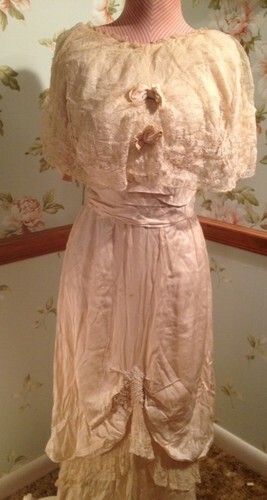 It's a post WWI dress but before the 1920's. I really love the closure on this one. 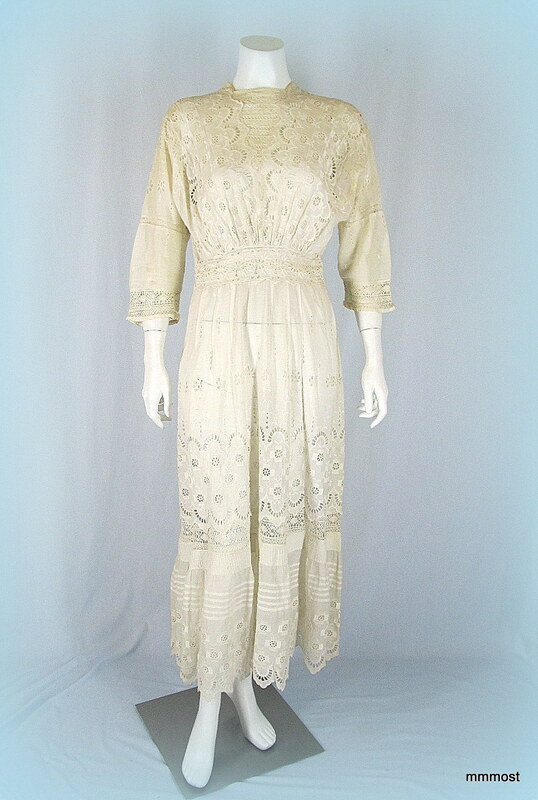 Featured in this auction is a beautiful cotton tea dress from the 1910s...It has mother of pearl buttons down the center back, elbow length sleeves and many kinds of embellishments in the fabric including cutwork, eyelet, embroidery, crochet, lace and pleating...Additional closeup photos are in the gallery at the top of the listing...It has yellowed perspiration stains and is lightly soiled around the neckline...A good soaking in Oxi-Clean or similar would probably take care of these and brighten it up...Otherwise, it is in very good and wearable condition. 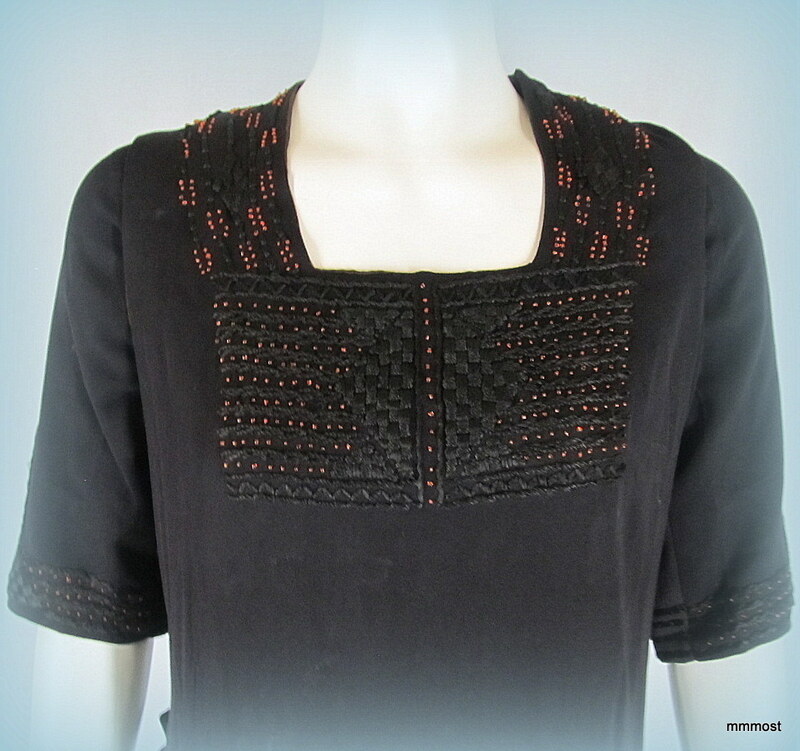 This is one of several vintage clothing items I have on separate auctions...Please click on the My Auction Gallery button below to see the others...I will gladly combine to save on shipping charges. 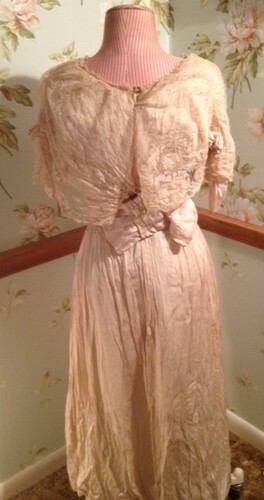 Photo of Gown being worn by Original owner! This dress goes beyond beautiful. Listed in a picture with the original owner wearing the dress. 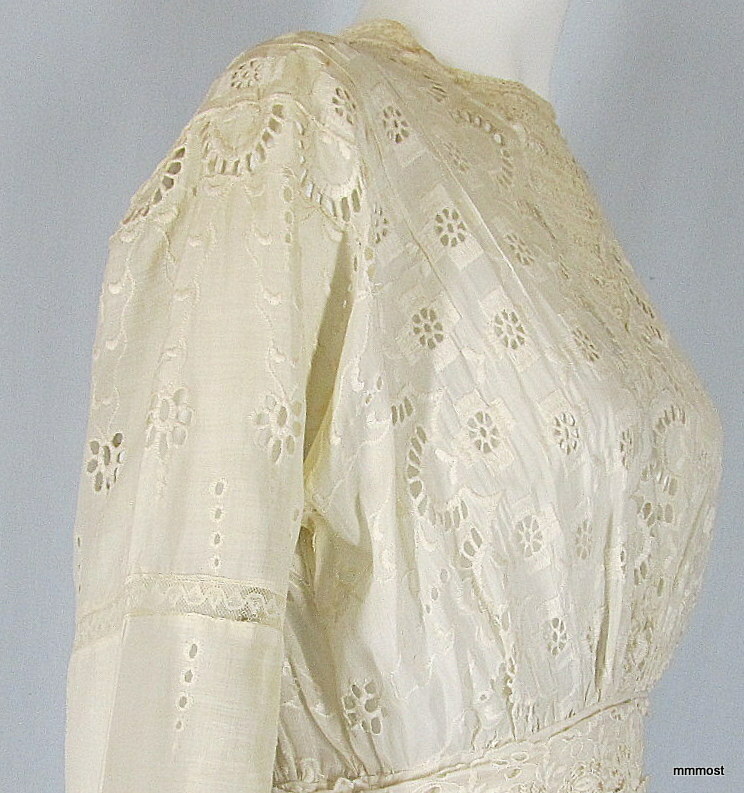 Turn of the century ivory silk and lace tea gown. 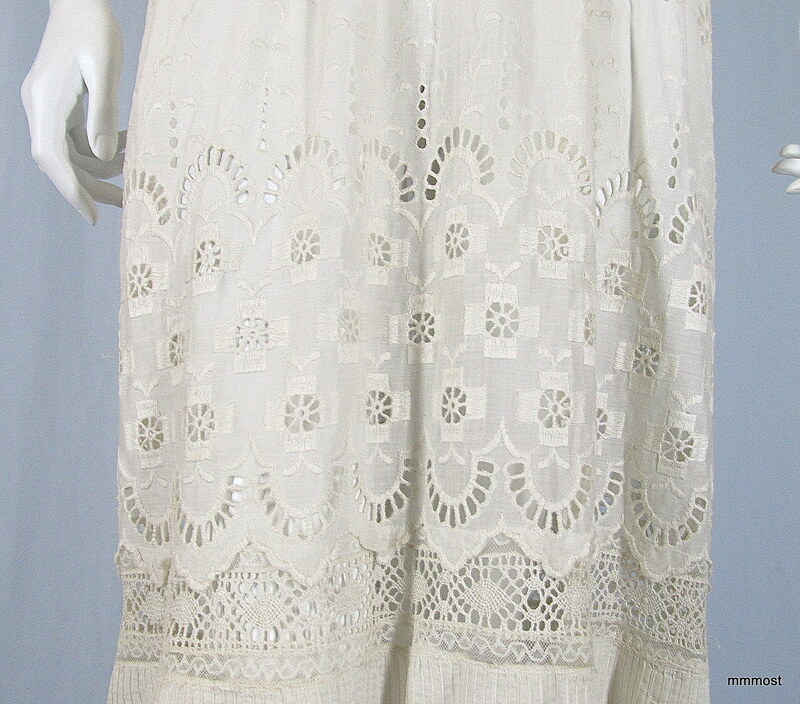 Beautiful real pearl and glass bead embellishment on the draped hem. 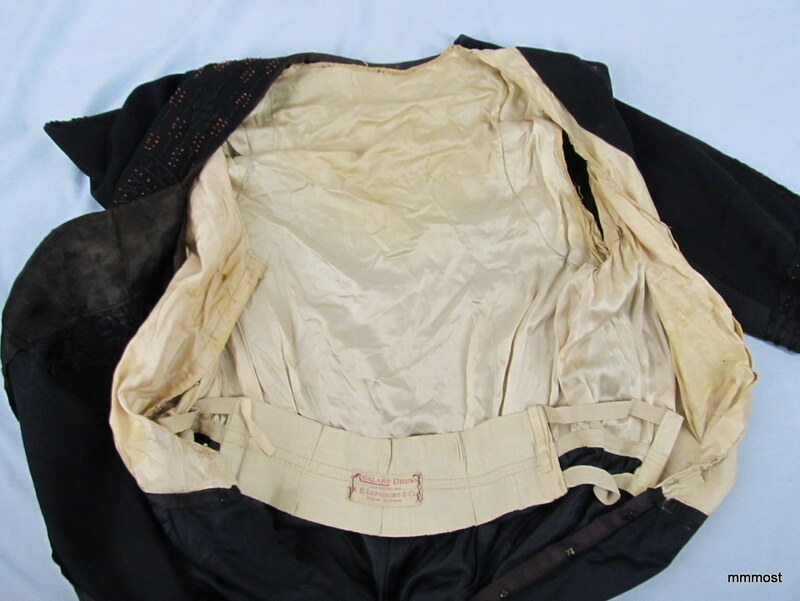 This piece is a bespoke piece with the foundation made into the piece negating the need for the tightly fitted undergarments required for these pieces. 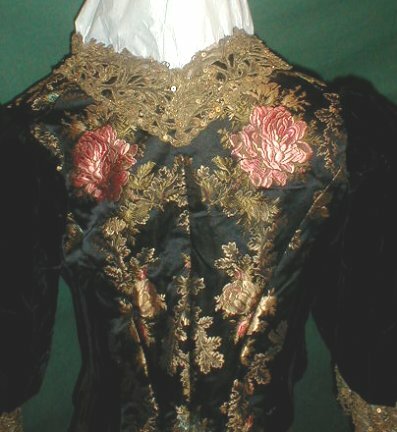 The waist measures 21" and bust is 26" so I am not selling this as a wearable piece but rather an occassional display piece or to add to your collection of antique gowns. My mannequin is not small enough for the dress so I did not get a good pictuer of the back of the dress. 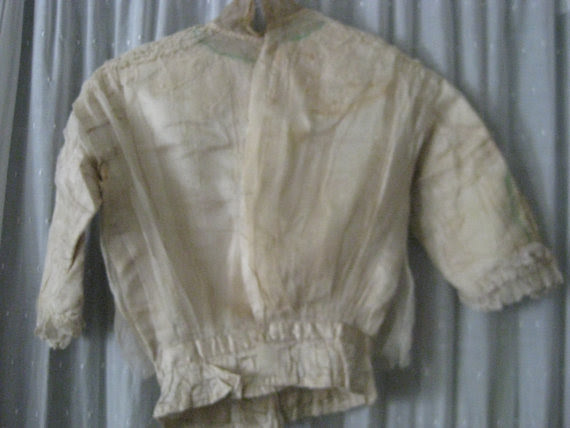 Because of the delicate condition I did not want to strain the material so have it pinned to give an idea of how the back looks. Don't let this one get away. 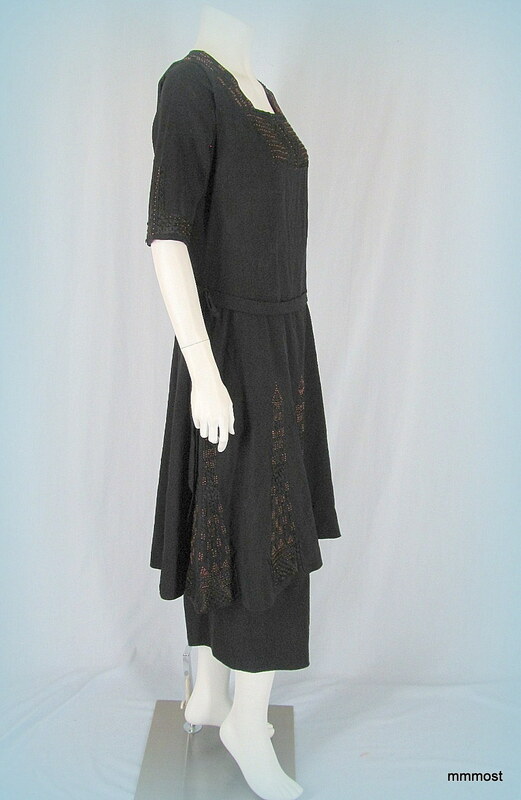 These pieces are getting hard to find and other than wear that should be associated with a garment of this age, there are no stains, tears, holes, rips or other damage we could find. 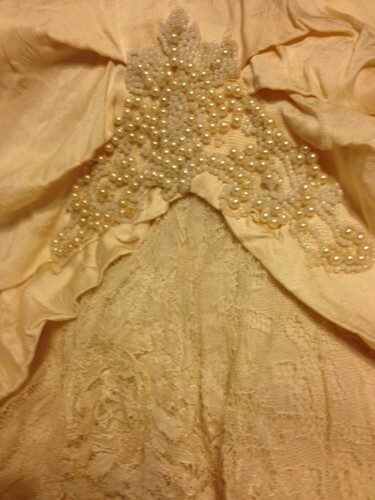 I love the pearl detail! 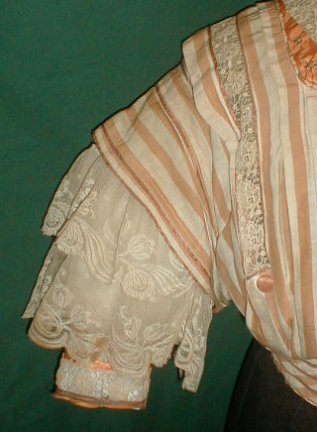 I wanted to include this one for the sleeves. 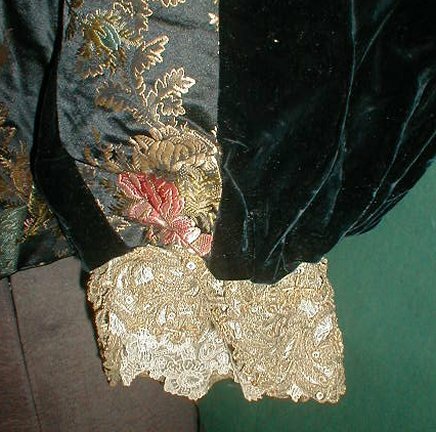 Look at that lace! 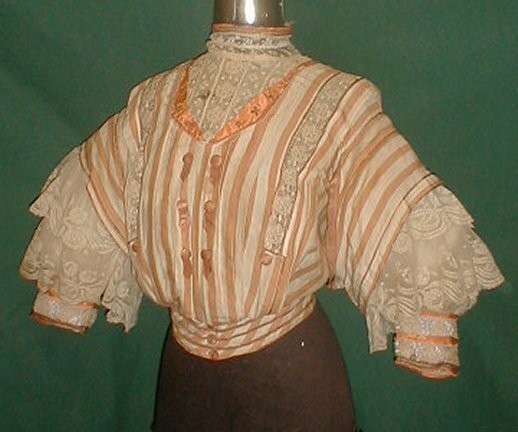 Yes, the blouse itself is rather plain but the sleeves are pretty darn cute! Not really much can be added , the pictures say it all. 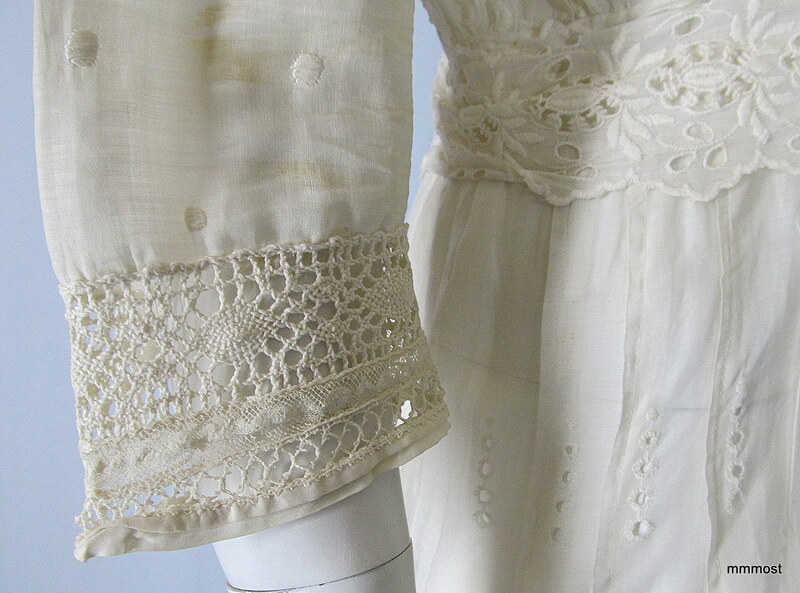 an unbelievable amount of lace appliques. 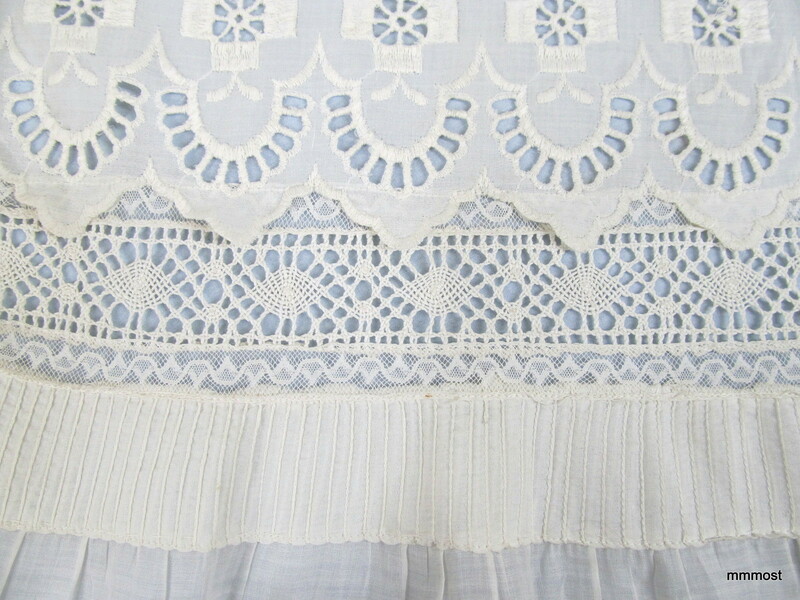 very, very fine pleated chiffon. silver braided trim, both front edge and cuffs. giving it a three dimensional look. This auction is for the COAT only. Arm pit opening : 8"
It needs cleaning by a specialist. 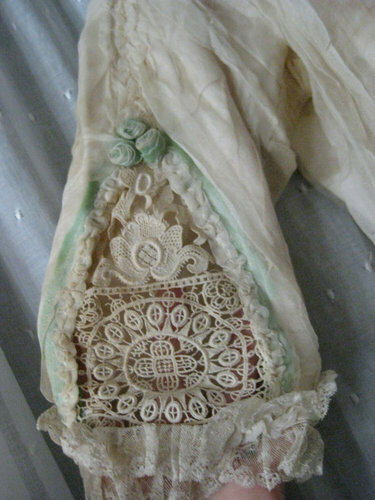 All the lace is in excellent condition. The major difference between this one and the one I posted a few minutes prior? 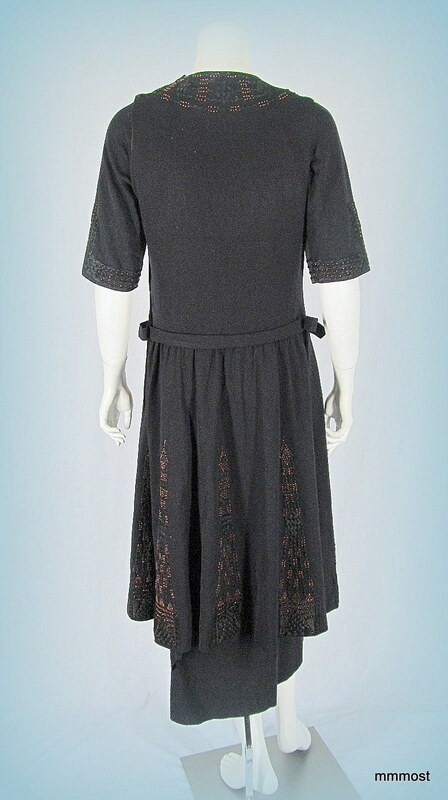 About $2,500. 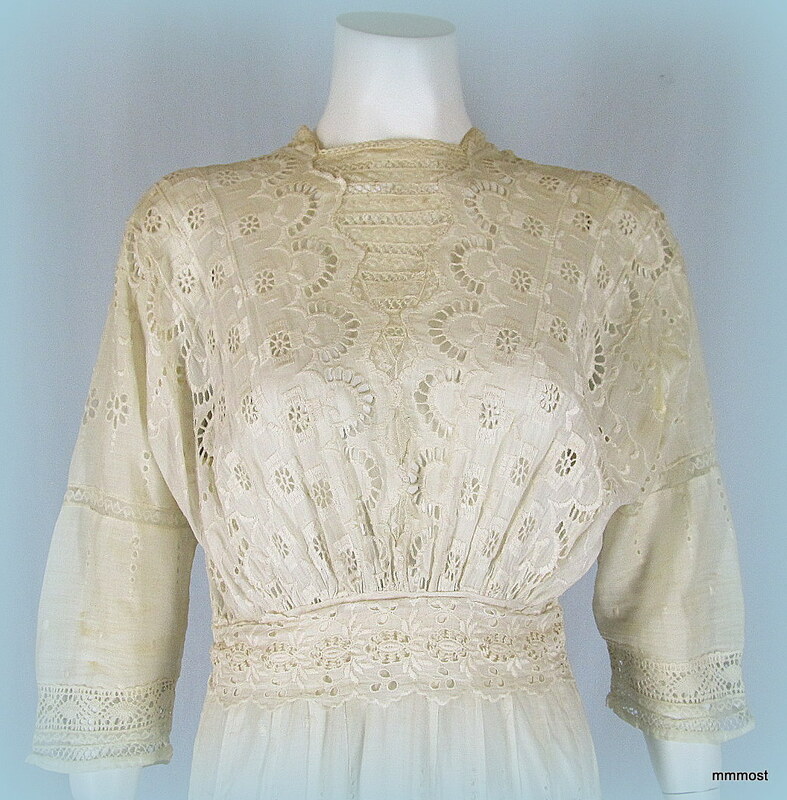 Yes, this one is in much better condition and OMG look at that lace on the inside but that's really about it. Same time period, same styling. 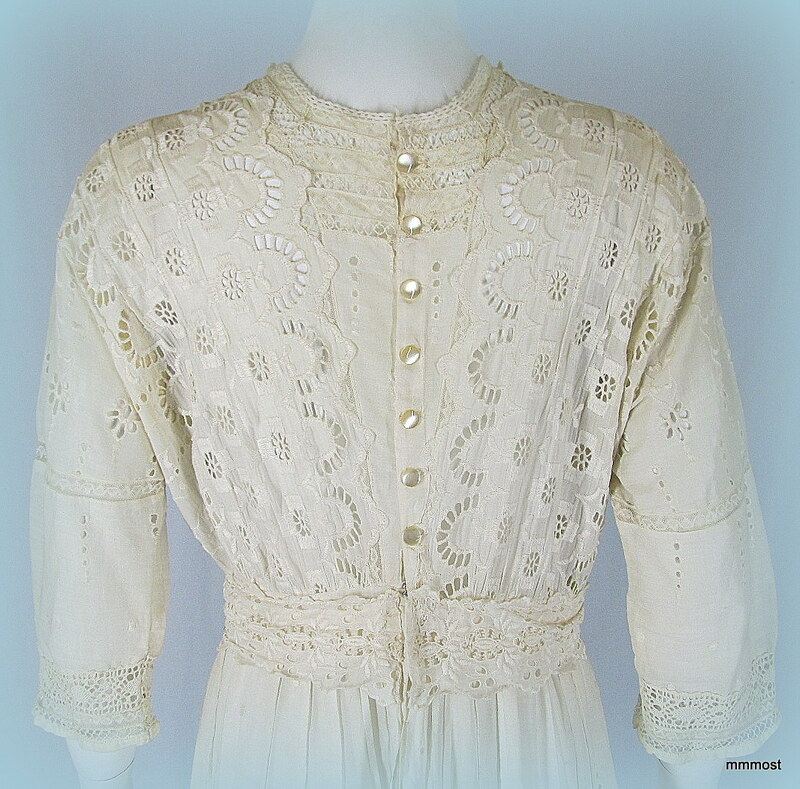 Vintage Edwardian wool coat with lace trim and cutouts at bottom of coat. Green velvet trim. 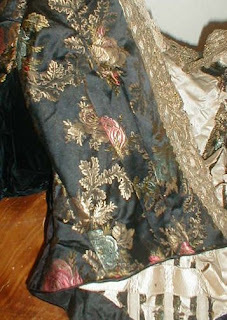 Fully lined in silk, edged in embroidered flowers. 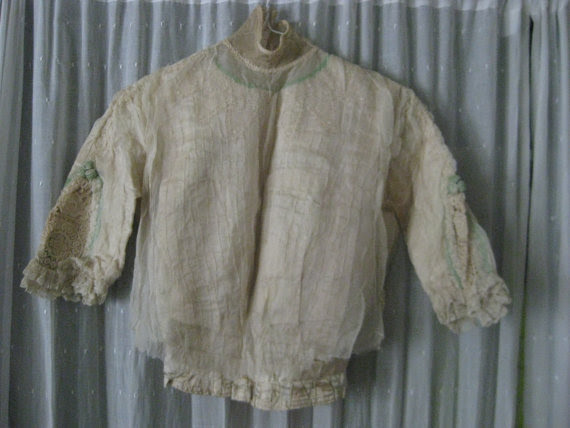 The coat has stains on inside back of lining and moth holes at back (see photo) and various tiny moth holes on wool. Sleeves gather into cuffs. 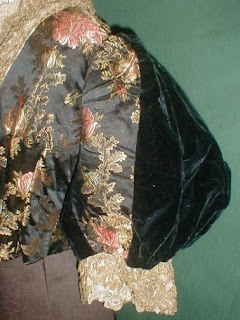 38" chest, 46" from back neck to bottom hem. 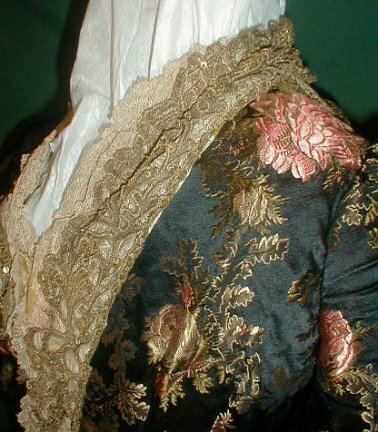 Imagine wearing this while brushing out your hair in the winter, ladies! A romantic 1890’s pale orange and beige stripe cotton and silk blend bodice. 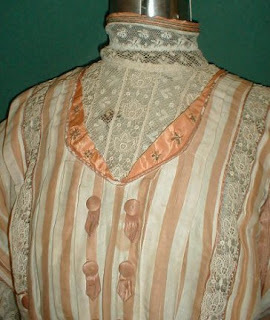 The bodice has a high neck lace insert that is outlined with tangerine silk. The leg of mutton style sleeves are trimmed with two wide lace flounces. 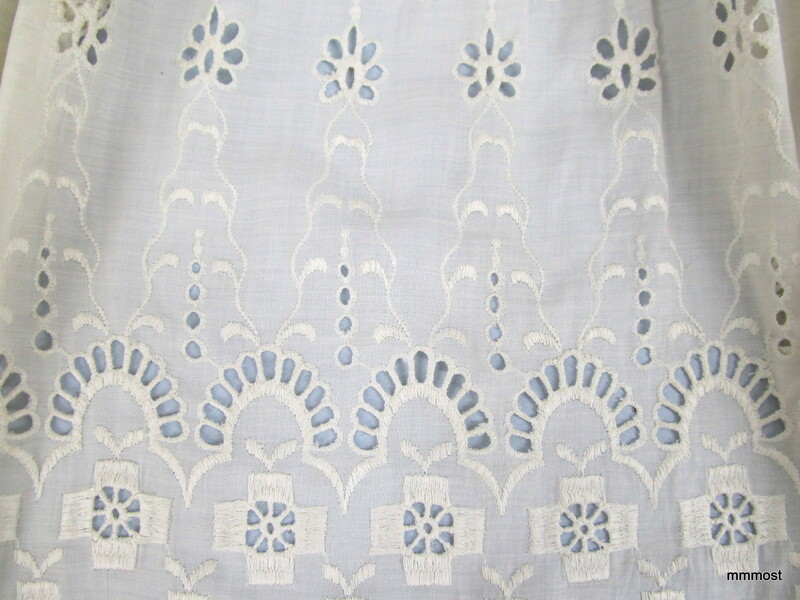 The lace has a tulip pattern. 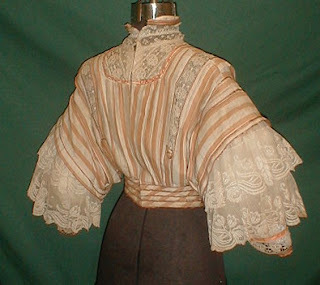 The lace is attached to an ivory chiffon base. The front of the bodice is trimmed with lace inserts and silk covered decorative buttons. 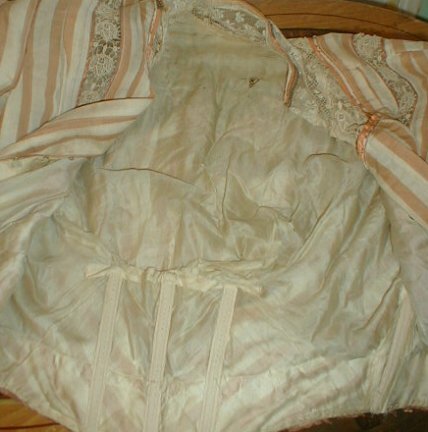 The bodice is lined with silk and has a back hook and eye closure. 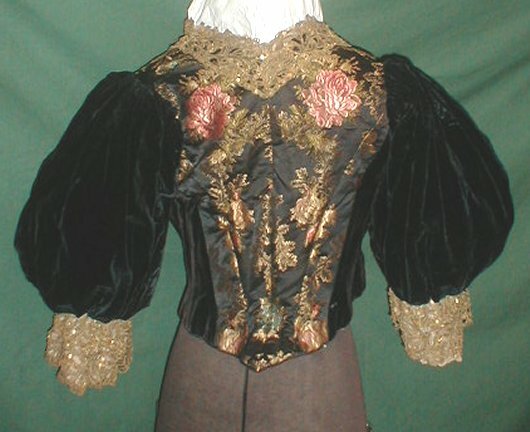 The bodice is in good condition. 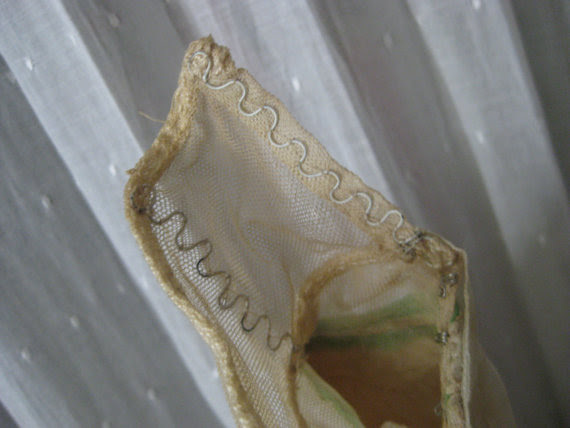 There is a hole in the lining that shows through the neck lace insert but no hole in the lace itself. 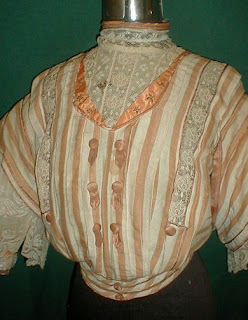 There is a nickel size spot on the front of the bodice and a couple on the lace flounces. 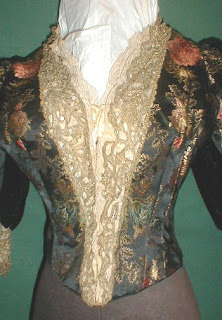 There is one missing decorative button and one that is missing some of the silk covering. 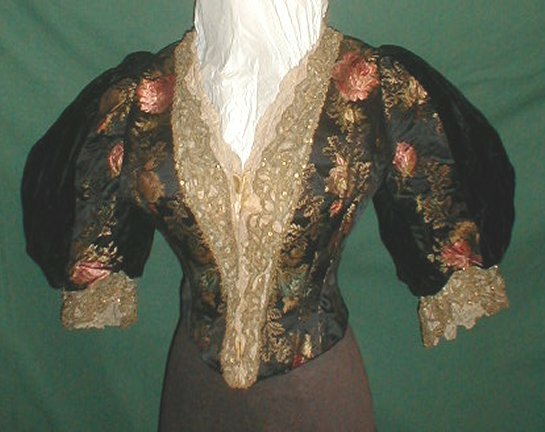 Bust 34 Waist 24. 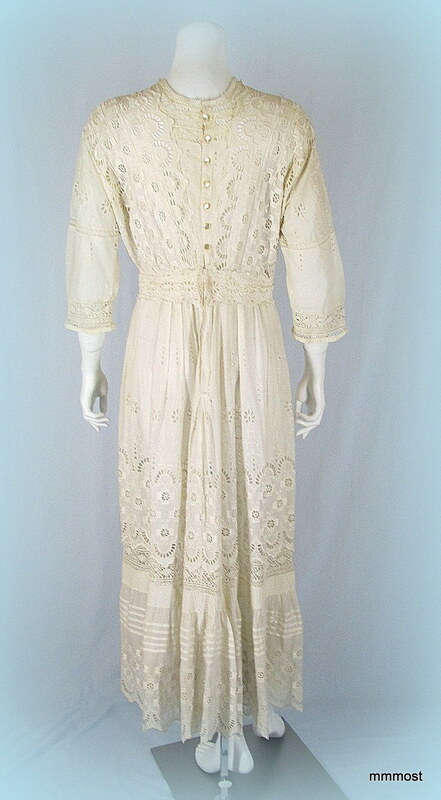 Although the seller thinks it's 1890's, I'm thinking very early 1900's for this. 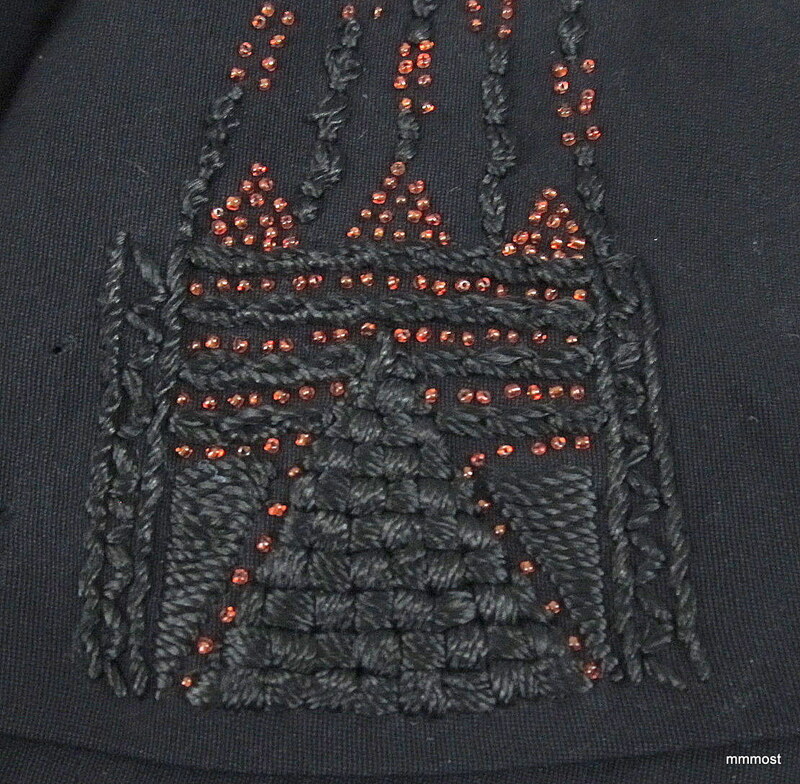 The way it's cut looks like a pigeon front with some of the sailor styling influence that was popular in the 1900's. 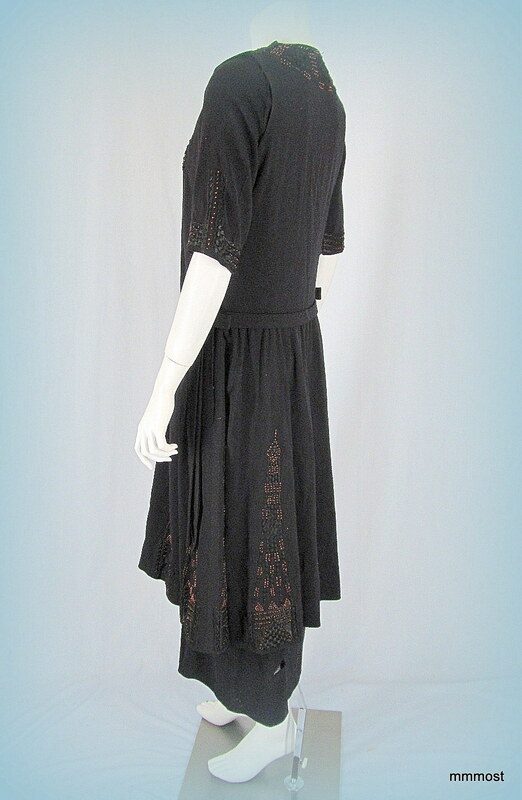 This seller deletes his photos typically pretty quickly so I'm glad I caught this one and the next one. I *adore* the colors of this bodice and which the skirt survived as well, but alas, it didn't. 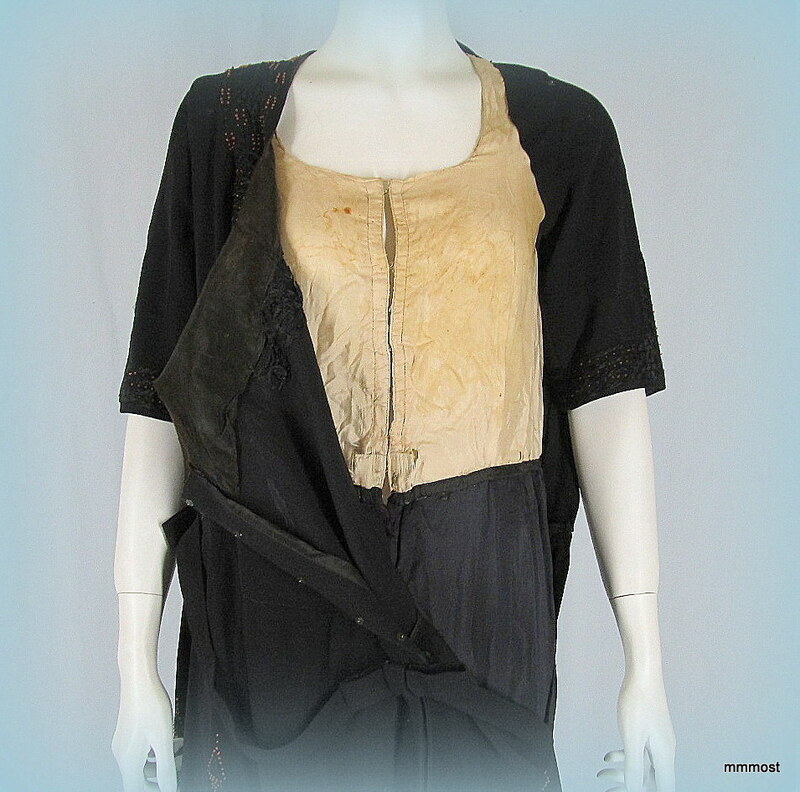 Teens Era Swimsuit with accessories! "I'm too young to be a widow!"